Take a lot of sunshine and crystal clear water in all colours between turqoise and emerald, put some mild breeze, pine-shaded shores, lonely bays, steep coasts, exotic islands and, add a couple of olive, fig and lemon groves. Then mix them with bright blue sky, picturesque sunsets and enchanting starry nights. Would you like it? 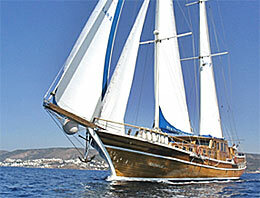 Well, if yes, then how about a "BLUE VOYAGE" on a Turkish wooden sailing yacht called GULET, hand-made of mainly pine. In the meantime, a lot of titbits will be prepared for you. Since the Turkish cuisine is one of the best in the world, You will enjoy the delicious food and love the exotic flavour! In the evening, taste a glass of excellent Turkish wine or raki and let the unforgettable times of the day pass in review and spend some time with your fellow travellers. The crew consists of three members; the captain, the cook and the sailor. They will take care of you in the best way of Turkish hospitality; never obstrusive but always kind and punctual. Anything from serving meals to cleaning is their job. The gullet M/S YILDIZHANLAR is one of the boats that really sail. Not only that this ship has been created by ship builders using traditional methods, but sea-men and artists have also added their ideas. Once on board the M/S YILDIZHANLAR you will find yourself in an atmosphere of nostalgia which evokes the golden age of oldtimer sailing ships. The M/S YILDIZHANLAR meets all the demands of its discerning clientele for a nostalgic and romantic cruise. At the same time she offers all the comforts you would expect to find on your holiday. She has 6 cabins with wide, comfortable double beds or single beds. Four cabins are with a third bed. Your bath here is large and comfortable and the toilets work using the flush system, just like the ones you use at home. Your Itinerary: You may start your journey either in Bodrum, Marmaris or Gocek, we can plan and arrange it with you, depending where you wish to go (map here) or according to your chosen airport, Bodrum or Dalaman, depending of course on bookings before or after. The Captain knows each harbour and every cove on this beautiful coastline. The cruise will follow a fixed route which will be discussed with everyone on board. No sooner has the ship dropped anchor in one of the turquoise-coloured bays than the M/S YILDIZHANLAR crew invites you to have a go at windsurfing or kayaking. You can snorkel to your heart's content! In the months which are not so warm, walks to ancient places or to nearby typical villages are the favourite pastime. 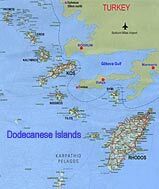 On request, the captain will also organize excursions to points of interest and ancient cities either on the coast or inland. The Turkish cuisine. On board the M/S YILDIZHANLAR you will find the finest Turkish dishes, prepared using the freshest vegetables, fish and meats. Our cook is an expert in his field. He will pamper you with three meals a day: breakfast, lunch and a dinner. If you have any special dietary requirements (if there are certain foods you dislike or mustn't eat), simply let him know. He will be able to prepare dishes to suit your exact taste. There is nearly none of the gullet charter-companies who tells you the truth about the use of air-condition on Gullets. Yes, yes M/S YILDIZHANLAR has AC and you think you can switch it on when you like. Unfortunately it's not! On a boat the AC can only run when the generator is on, or in a harbor when connected to 220 Volt. But mainly you are in anchor bays, often next to a neighbor who doesn't like the noise of your generator and you wouldn't like it either during the night for example. Complete navigation equipments, Mobile Phone, Generator, Life Raft, Life Jackets, Fire Extinguishers, Fully equipped Galley, Refrigerator, Deep Freezer, Ice Boxes. for your fun we have a windsurf and canoe, fishing and snorkeling gear. And of course, like all our boats, also the M/S YILDIZHANLAR meets international safety regulations including life jackets, fire extinguishers and alarms.